Yesterday was a marathon day and today is shaping up to be longer. We had a very busy day yesterday with the large loggerhead graduating (YEA! 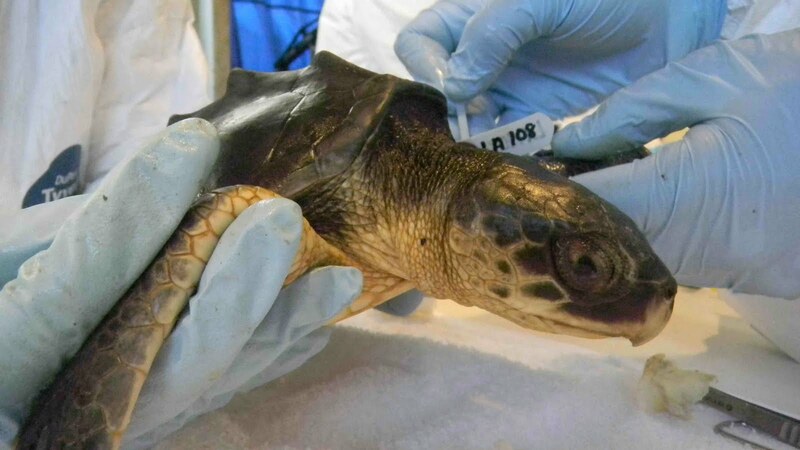 ), a round of radiographs (X-rays) for several turtles and three new oiled turtles. In light of our treatment schedule, I'll keep this short and catch you up later tonight or first thing tomorrow morning. Below, staff and volunteers from Aquarium of the Americas (AOA) document a new Kemp's ridley arrival. Photo documentation is essential for each animal that comes to the turtle center. In the photo below a new arrival receives his first de-oiling bath. 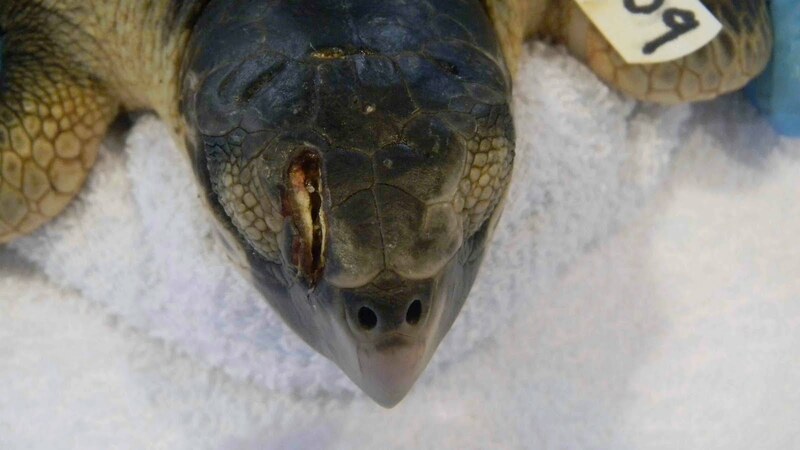 The photo below shows a turtle just after the first bath, you can still see a thin sheen of oil on the skin in some areas. The second bath usually takes care of all that. We could most likely remove it all during the first bath if we did a lengthy and aggressive scrubbing, however we have found that the animals don't do well with the prolonged stress of a lengthy bath. The two bath system works wonders for these animals. The majority of the oil is removed during the first bath with any remaining sheen removed the next morning. This oiled Kemp's ridley cme in last night. In addition to the oil, this animal has a cranial fracture. The vets thoroughly cleaned the wound and advised the bathing team to use caution around this site. This animal will have a radiograph today of this fracture. Okay folks, duty calls. I must depart for the facility to begin a very busy day of antibiotic administration, exams, baths, radiographs and other sea turtle procedures. We have a great group of folks here working to save these animals, it's my pleasure to be a part of this expert team. These updates provide great insights and information about the process and the turtles. It helps people connect to the effort. Really enjoy the pictures, too. Thanks for taking the time to do it, besides everything else. Your efforts are outstanding, I admire and honor the marine animal rescue team. Keep up the good work! Wondering how many turtles the team has treated so far? Have all of them come through Ok, or have some not made it? Great job and thank you for your efforts! Thanks for your hard work on the turtles and the blog! We really appreciate your updates!